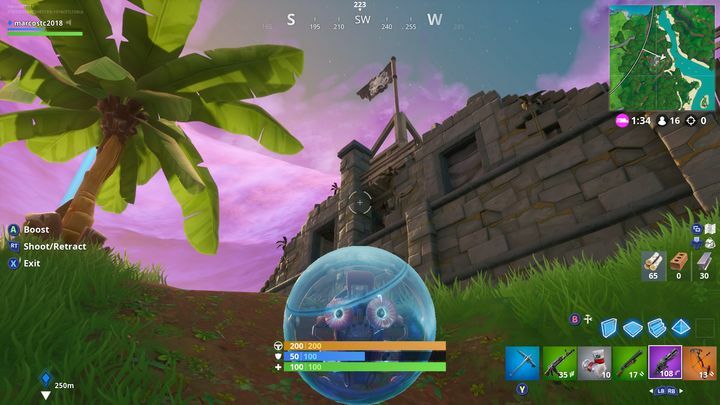 With Fortnite season 8’s now kicking and screaming, Epic has recently revealed the challenges corresponding to week 7 of this pirate-themed season of Fortnite. The free challenges corresponding to season 8, week 7 are the following: Deal damage with a pickaxe to opponents, Visit Junk Junction and The Block in a single match and Visit Pirate Camps in a single match. The first challenge of the week involves dealing damage with a specific kind of weapon. This kind of challenge was last seen in week 1, but the good thing here is that you don’t have to search for weapons and get armed before being able to complete the challenge, as you’ve got all you need right off the bat (the pickaxe of course). An alternative when playing solo Battle Royale instead of Team Rumble (you can change game modes from Fortnite’s lobby screen by pressing the interact button – this is the X button if you’re on Xbox One, and the Square button if you’re playing on PS4) is to get off the bus as quickly as possible and follow another player so that you can pummel him or her with your pickaxe just after you land, and before he’s got a chance to grab any gear. Of course, this can be a route to a quick elimination if your opponent manages to grab a weapon before you do, and going for an early pickaxe assault can also leave you exposed to any other armed players in the vicinity, but this surely is worth a shot in order to complete the challenge. Once you’ve dealt 100 points of damage to other players with the pickaxe, you’ll have completed this first free challenge of the week. The second challenge of the week involves visiting two named locations in a single match: Junk Junction and The Block. This kind of challenge was last seen in week 3, and the same advice applies here. 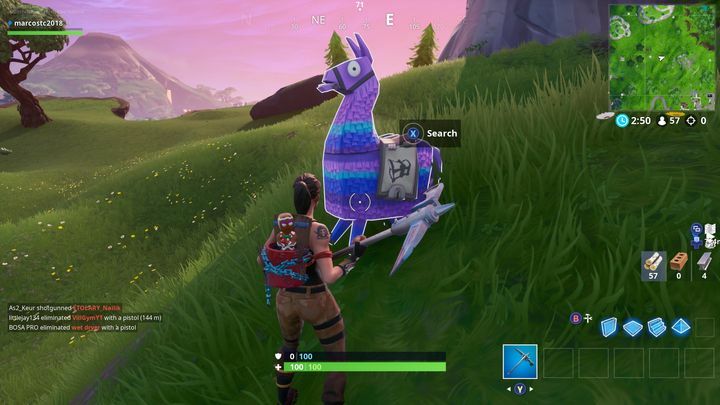 If you’re playing solo Battle Royale, visiting locations which are not on the path of the bus first might be a good idea, as you’ll encounter less players roaming about. Then it’s a matter of waiting a bit until the number of players on the map goes down (maybe find a hiding spot or something) and then travel to the second location you have to visit in order to complete the challenge. 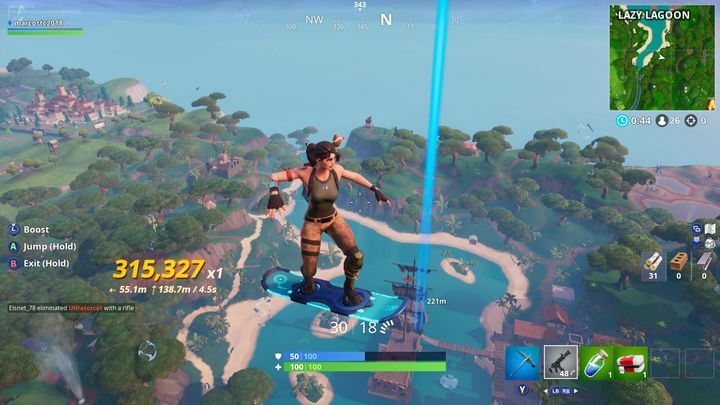 Using one of Fornite’s new vehicles, such as the hoverboard or the Baller (especially the latter as it provides protection from enemy fire) could be a good idea to complete the challenge faster. Also, when playing a team-based mode such as Team Rumble, you get gliders by default. 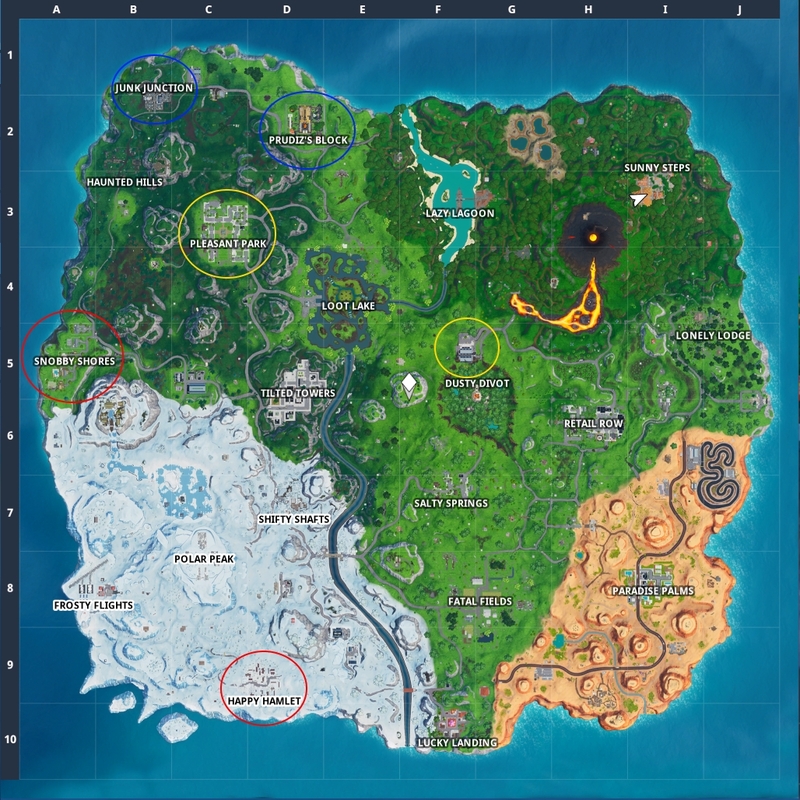 This makes it easier to get around the map, although since the storm closes in sooner in this mode you might have less time to travel to the two locations you’ll need to visit in order to complete the first stage of the challenge. At least you’ll respawn in the air upon elimination, so you can shorten the distance to the next named location by taking advantage of your glider. As was the case in week 3, this challenge has three stages: in the first you have to visit Junk Junction and The Block, in the second Pleasant Park and Dusty Divot, and in the third you’ve got to make your way to Happy Hamlet and Snobby Shores in a single match. The locations you have to visit have been marked on the map below (different colours have been used for each stage). The final free challenge of the week involves visiting Pirate Camps in a single match. This is a variation of the challenge seen in week 1, the difference here being that you’ve got to visit 3 Pirate Camps in a single game, and not all of them across several matches. As in the earlier challenge, playing Team Rumble mode might make things easier for you, just make your way to three of the Pirate Camps as quickly as possible, evading the storm and other players as necessary (if you get eliminated in Team Rumble, you’ll just respawn with all your gear though). In solo Battle Royale, you can try landing close to a Pirate Camp as far removed from the path of the bus as possible, and then make your way to the other two camps without getting eliminated by other players or falling prey to the storm. 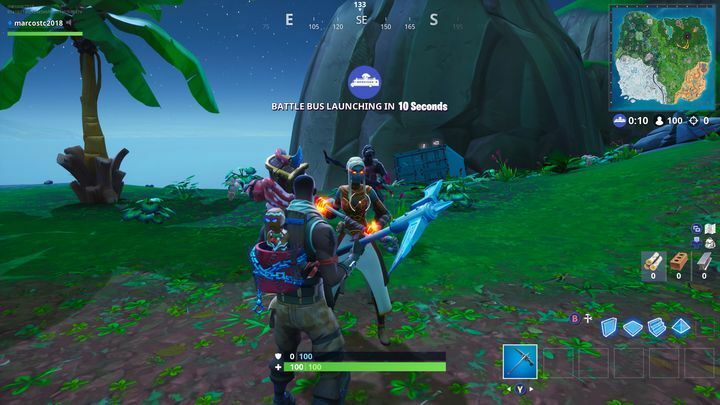 Of course, you can still land near a Pirate Camp close to the path of the bus (such as the one south east of Loot Lake for instance) if you don’t see many players getting off the bus at that point. There’s a Baller vehicle in this camp which you can use to travel to the two other camps in relative safety (this is what I did to complete the challenge). See here for a map showing the location of the Pirate Camps on Fortnite’s map. That’s it for week 7’s challenges then, but do stay tuned to this website for information on how to complete next week’s batch of challenges as Fornite’s season 8 moves forward this month.